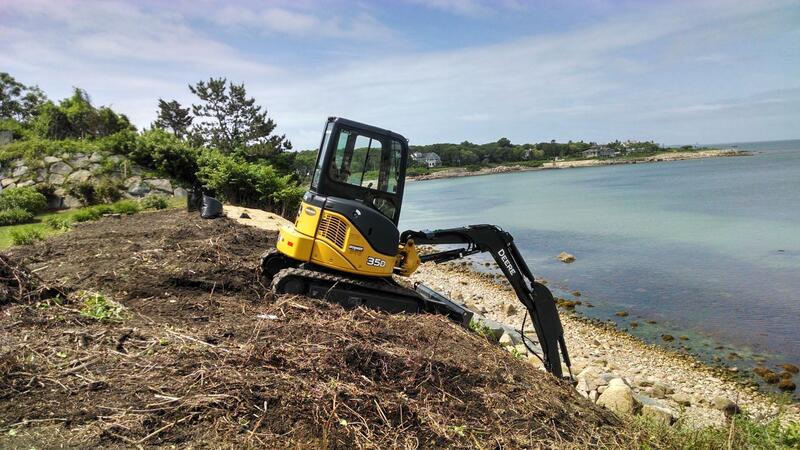 Over the past seven years the team at BlueFlax Design LLC has managed a multitude of landscapes degraded by invasive plant species. We have managed sites for species including shrub and vine honeysuckle, porcelainberry, Asiatic bittersweet, border privet, autumn olive, black swallowwort, Japanese knotweed, and others. 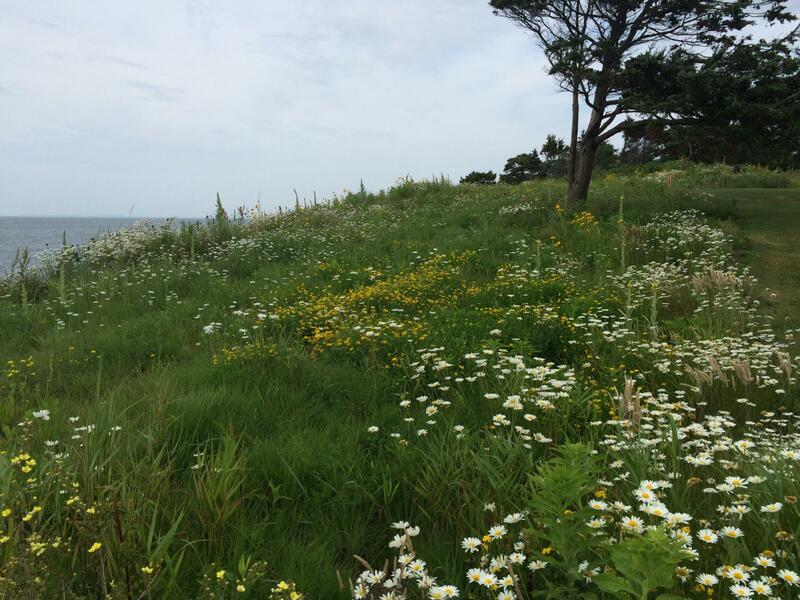 Four years ago we were introduced to a coastal site on Cape Cod that was comprised, almost exclusively, of each and every one of these invasive plants, covering just over a one-acre area. While this was one of the worst infestations we had experienced to that point, we were ready for the restoration challenge. Spring 2013. 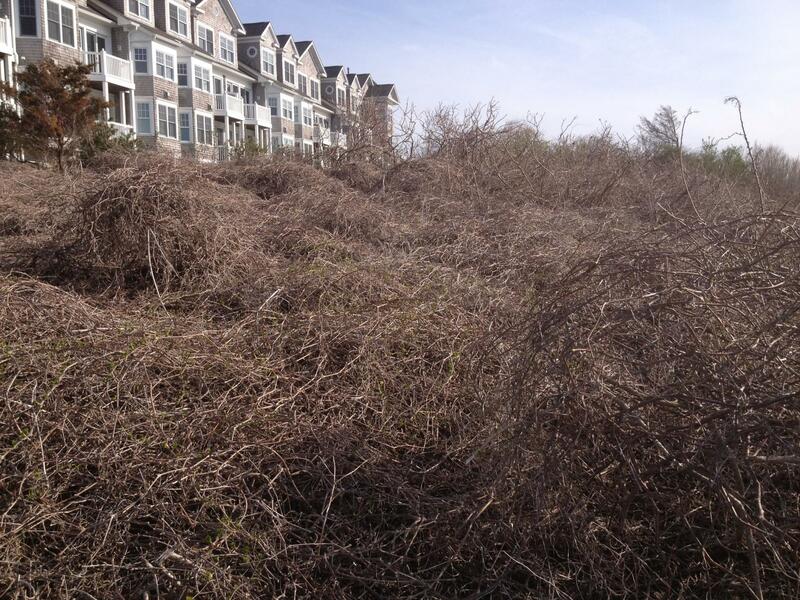 Nearly all native vegetation on the coastal bank has been smothered with mats of invasive vine material. Whenever we approach an invasive species management and restoration project we start with a plan, but in the case of this particular project we knew that a well thought out, feasible, multi-year management plan would be essential to the successful outcome of the project. 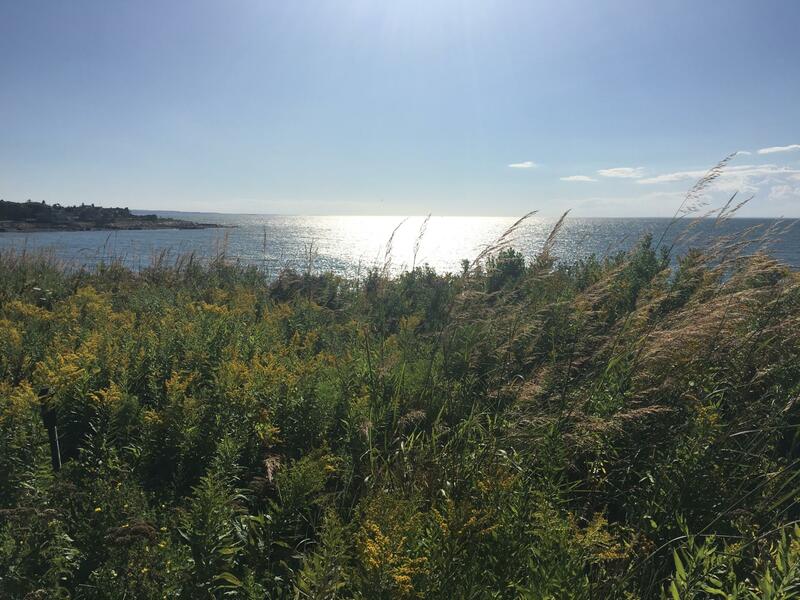 After working with stake holders including property owners, the local Conservation Commission, abutters, and others, we developed a five year plan that has seen us through four years of transformation from an overwhelmingly degraded coastal wetland resource area, to restored ecological integrity. Fall 2016. Three years after management and restoration was undertaken we have a native grass and wildflower meadow teaming with butterflies and other pollinators, birds, and small mammals. Every project starts with the outline of a plan that describes the sites history and existing conditions, helping us to understand how the current situation came to be. From there we consider the goals and objectives of the project, and choose best methodologies to meet them. Next we develop the restoration plan, starting with the questions such as, “What is going to take the place of these invasive plants once they are removed? How are we going to restore biomass, improve the ecological integrity of the wetland resource area, and meet the functional and aesthetic goals for the property owners?” Finally we consider short and long-term maintenance: how will we follow up and maintain the site over the first three to five years after intensive management and restoration and how will future property owners, maintenance contractors, and others ensure that the site remains ecologically healthy? Each of these questions is carefully considered, studied, and answered through the planning process, prior to commencing any management and restoration project in order to ensure a successful project outcome. Once the management plan is in place, it is time to begin implementation. 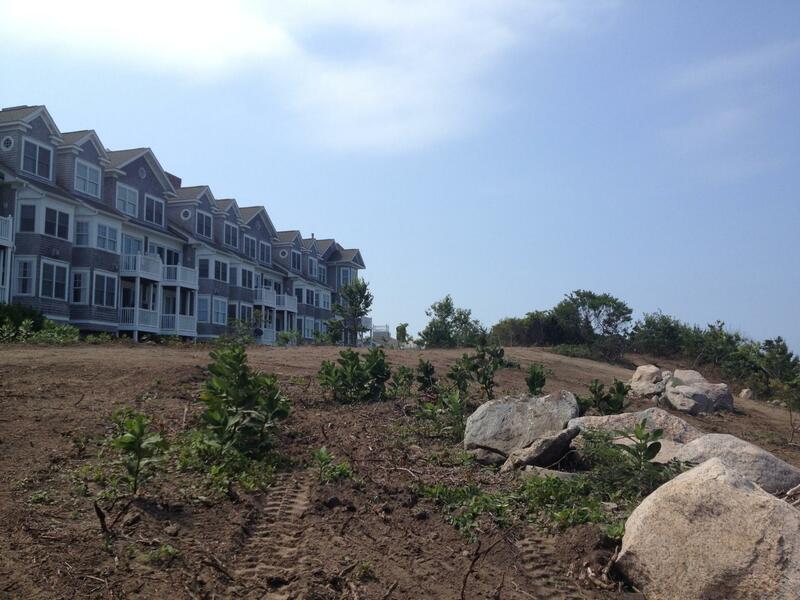 As described earlier, this project site comprised approximately 46,000 square feet of heavily invaded coastal bank and buffer zone wetland resource areas. Invasive plants present on site included Japanese knotweed, black swallowwort, Asiatic bittersweet, porcelainberry, shrub honeysuckle, vine honeysuckle, autumn olive, and border privet. 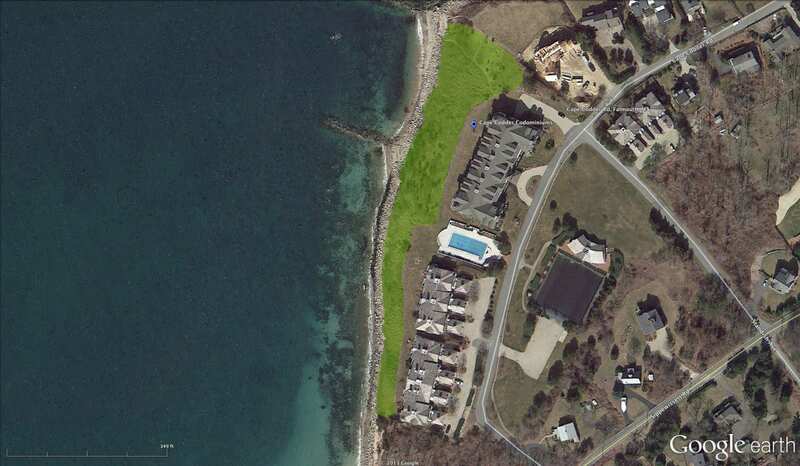 Overhead view of project area, shown in green. 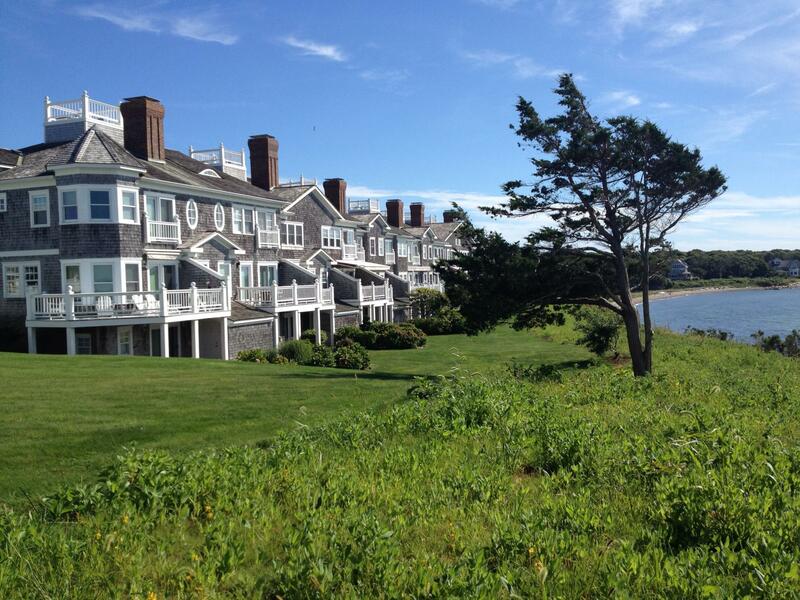 The project site was formerly host to a popular hotel, renowned for its sunset views. 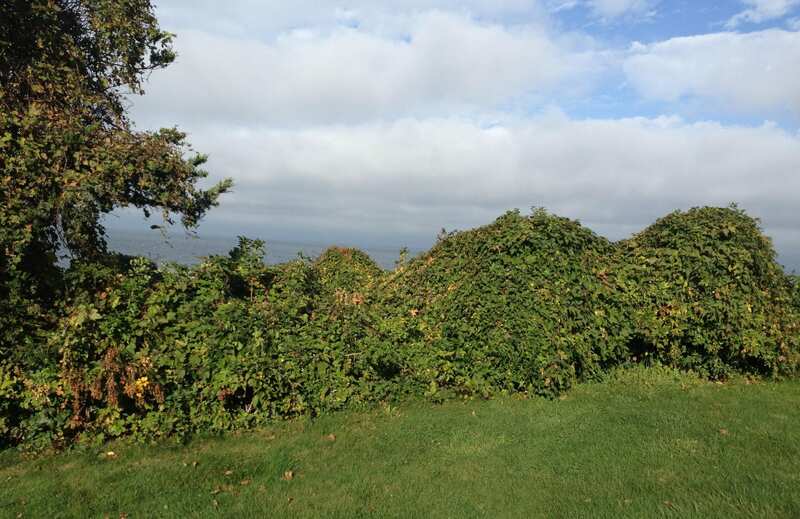 Some invasive plant species, such as border privet, autumn olive, and porcelainberry, had been purposefully planted as part of the hotel’s extensive landscaped grounds. The hotel was demolished and redeveloped in the 1980s, a project that consisted of intensive regrading of the site. In 2004, a restoration attempt was made; however, due to lack of oversight, internal conflicts, regulatory issues, and lack of a clear long-term plan, this restoration attempt failed, and all areas of the property within conservation jurisdiction (wetland resource areas) remained relatively untouched until our project implementation began in 2014. April 2013. Layered mats of bittersweet and porcelainberry vine covered the northern portion of the project site. From the existing conditions and identified goals and objectives, we developed a five year management plan consisting of invasive species management methodologies (selective herbicide treatments, mechanical removal, and mowing), along with protocols for seeding and stabilizing soils, phased restoration planting, and long-term maintenance. After obtaining all proper permits from the local Conservation Commission and Department of Environmental Protection, implementation was underway in early summer 2014. 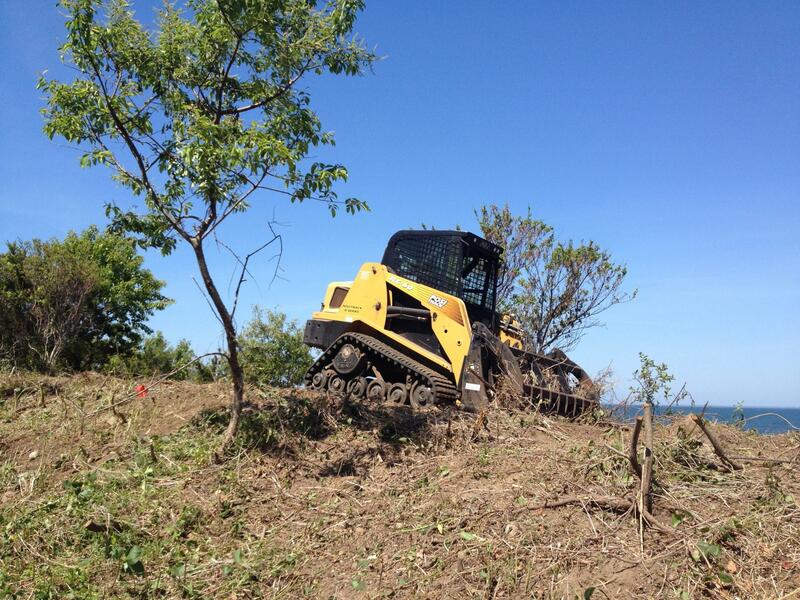 …and by grubbing of some invasive plant material using a mini-excavator. Immediately post clearing, soils are raked out, seeded, rolled, and covered with chopped straw on flatter area. On steep slopes, we spread 100% biodegradable erosion control blanket. July 2014. 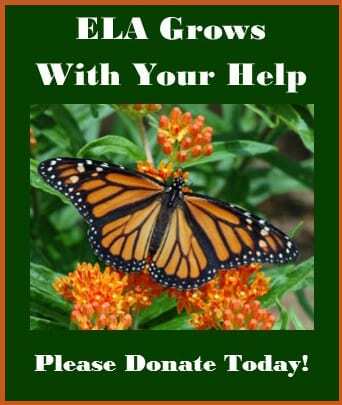 We were able to protect existing milkweed stands throughout the project area. 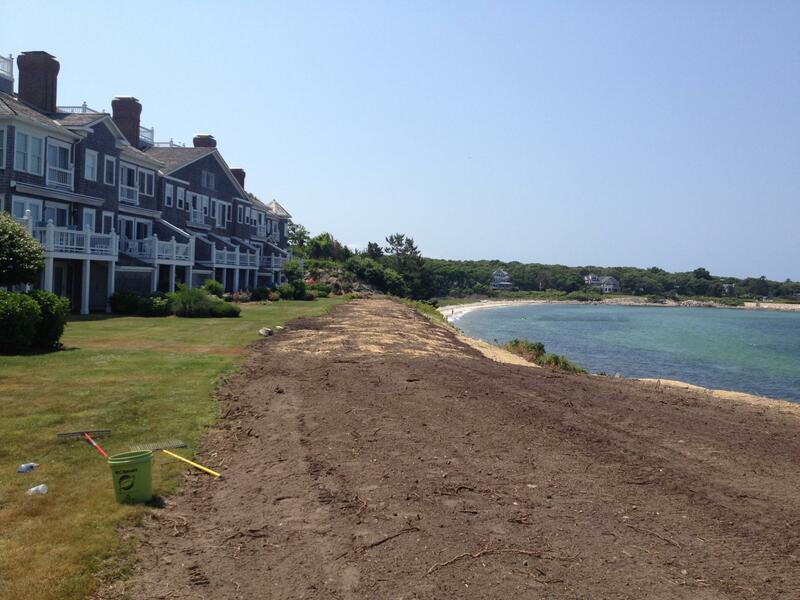 Bare soils were prepared for seeding with a mix of warm and cool season native grasses and wildflowers. July 2014. Native woody vegetation in good health was preserved throughout the invasive species management process. 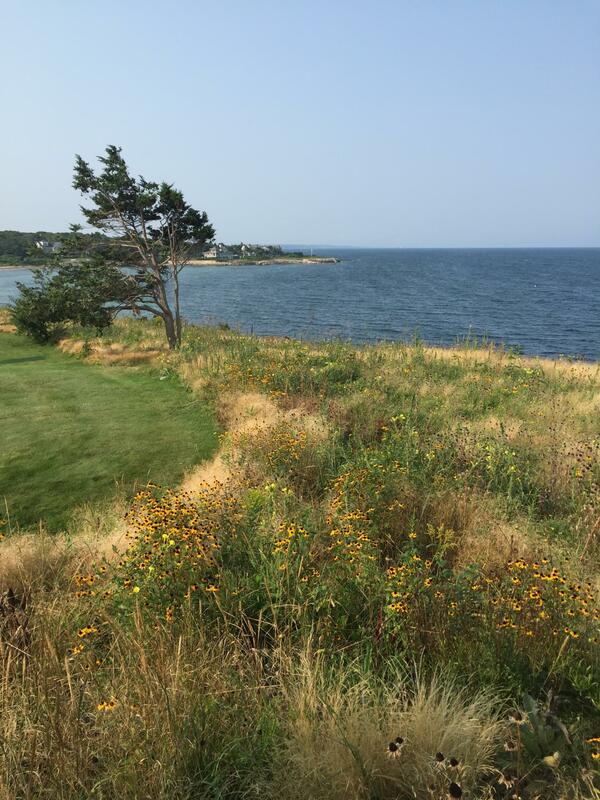 Native vegetation in poor health was flush cut to encourage regeneration. July 2014. 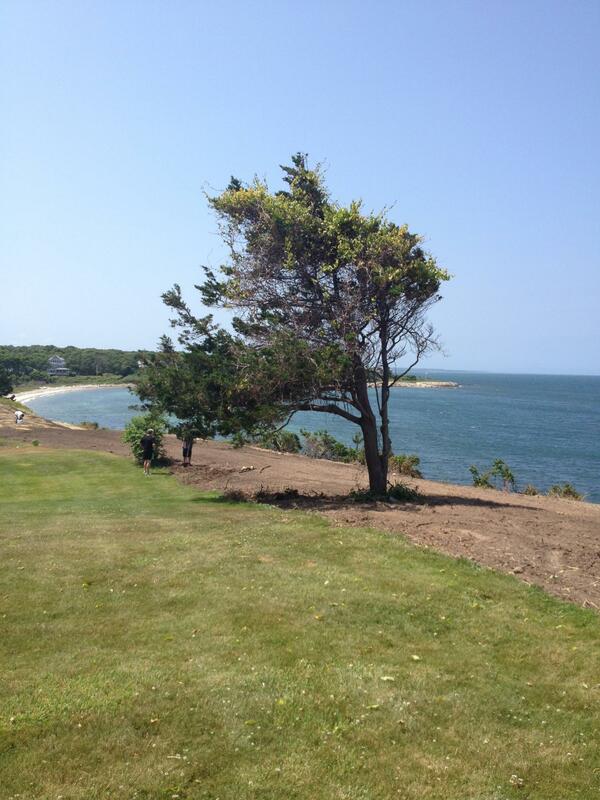 One lone eastern red cedar tree remained in the southern portion of the project area. Vines strangling the tree were cut and treated, then allowed to biodegrade before being pulled to reduce further injury. July 2014. Seeding shown underway was followed by chopped straw application. July 2014. 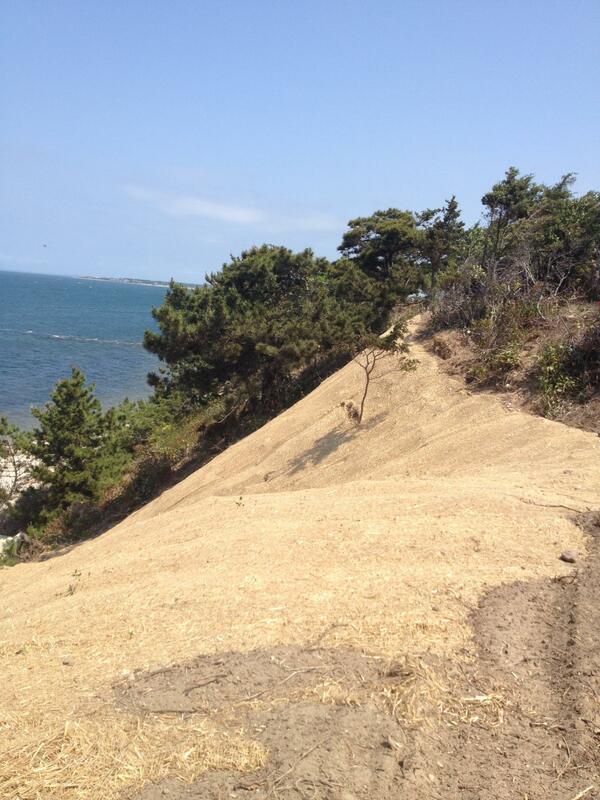 After seeding steep slopes were blanketed with 100% biodegradable coconut/straw erosion control blanket. Three months post initial intensive management phase seed mix has germinated and covered most bare soils. 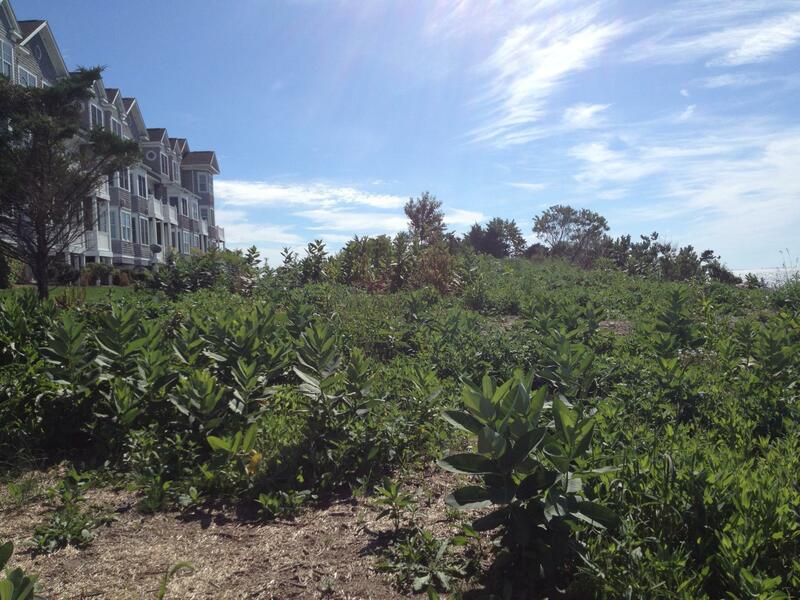 Selective follow up herbicide treatments to Japanese knotweed, black swallowwort, and other invasive species continued. We observed excellent to patchy germination of seed mix throughout project area, so commenced plugging of native grasses in areas where germination was spotty. …while we experienced excellent germination in the southern project area. Following the first year intensive management phase, follow-up management and maintenance was underway, beginning with the year one mowing protocol. At this point cool season European pasture grass and annual/biennial non-invasive weeds were the most significant management issue. As predicted, black swallowwort remained a serious management challenge, while bittersweet and porcelainberry resprouts were as expected. Woody native vegetation, flush cut for protection during the intensive management phase, had already begun to regenerate. Over seeding and plugging of bare soils the previous fall resulted in significantly improved germination and coverage. Late spring/early summer 2015. We found an increased presence of warm season grasses, along with cool season noxious weeds. June 2015. Overseeding and plugging bare areas resulted in improved germination and coverage. June 2015. Native woody vegetation, flush cut for protection during the intensive management phase, had begun to re-sprout. Eighty percent control or better was achieved, and the first phase of restoration planting was undertaken. 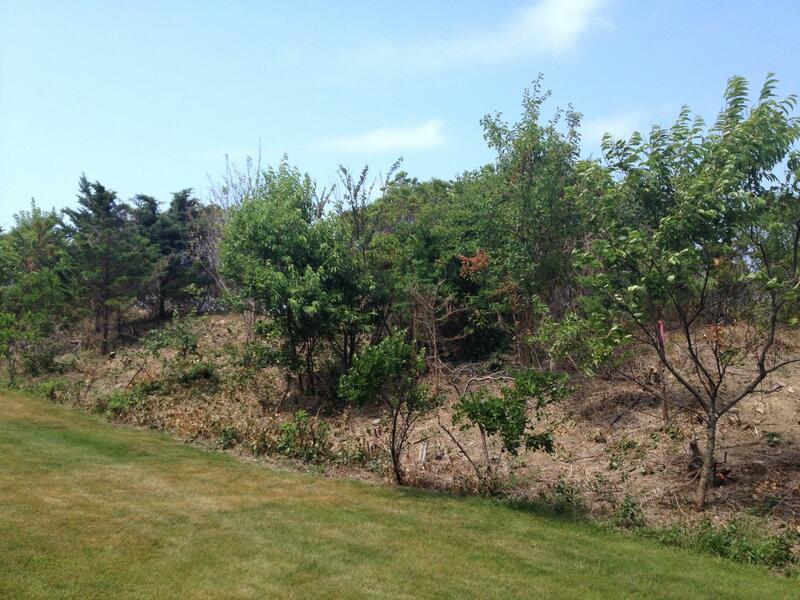 Follow-up management of Japanese knotweed continued, while native plants including bayberry, beachplum, and staghorn sumac, flush cut during the initial management phase, continued to vigorously resprout. September 2015. 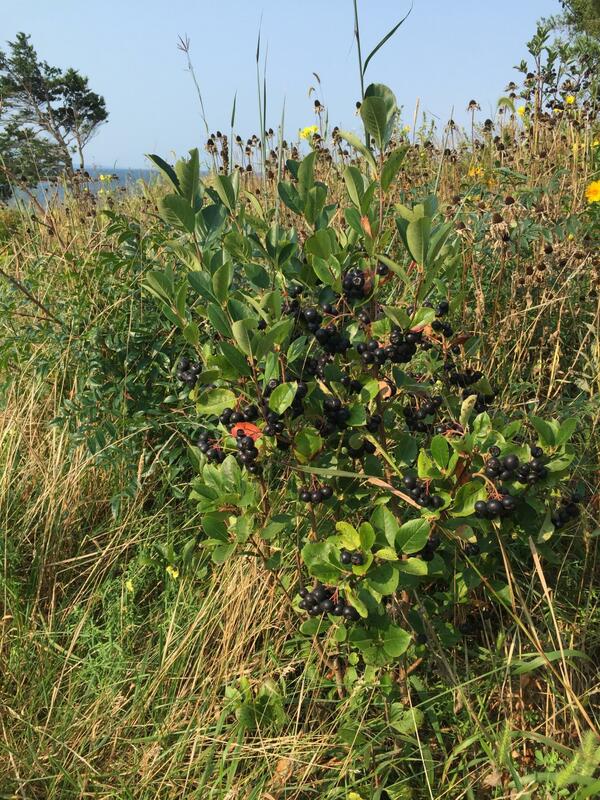 Native woody vegetation including black chokeberry was planted as part of the first phase of restoration planting. September 2015. Warm season grasses and wildflowers are abundant throughout the project area. 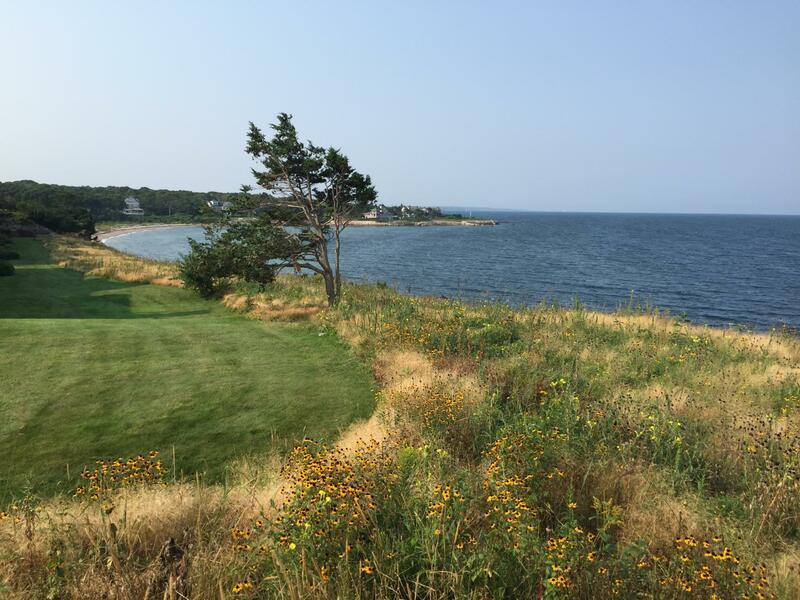 Management and maintenance continued per the management plan throughout spring and summer of 2016 with some minor plan changes made based on weather conditions. Temporary irrigation was installed to support restored woody vegetation throughout the drought period of 2016. 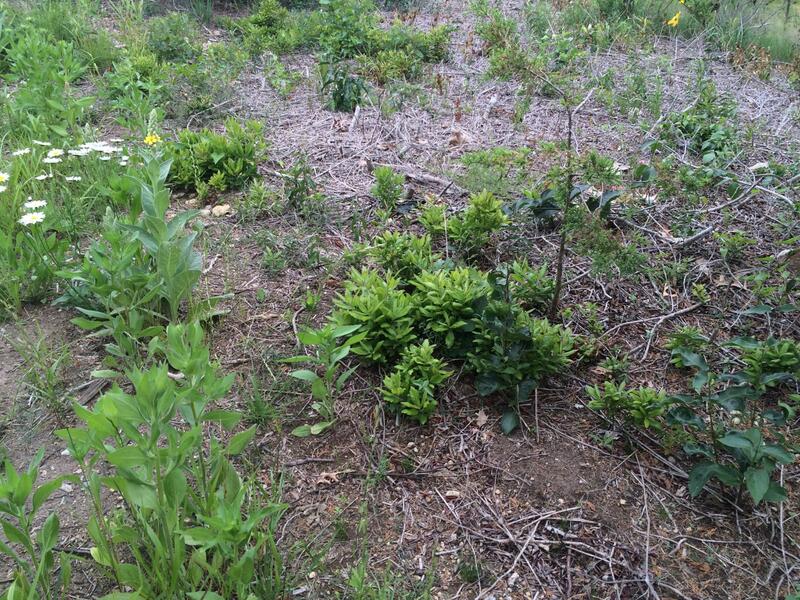 Selective treatment of black swallowwort was ongoing and required more monitoring and maintenance than initially planned. 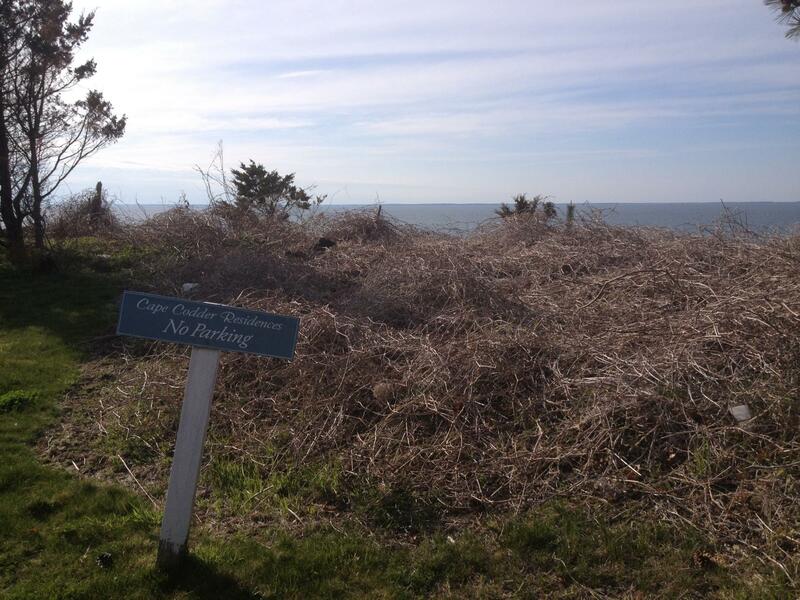 Japanese knotweed control was successful, and replanting of that management area began. October 2016. Existing eastern red cedar trees provide a back drop for newly planted woody vegetation, along with a multitude of late blooming grasses and wildflowers. October 2016. 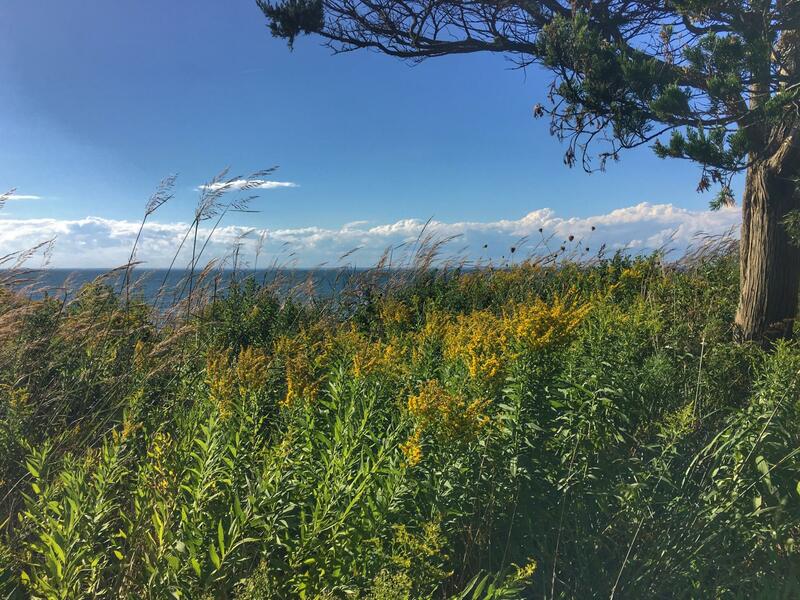 The deep blues of Buzzards Bay highlight the greens, golds, and purples of the late season meadow. Management and maintenance continues per the Management Plan established back in 2013. The structure of the meadow, being a dynamic system, has changed as some species, such as black-eyed Susans, have diminished, and others, such as more aggressive goldenrods, have proliferated. However, native warm season grasses including Indian grass, switch grass, big bluestem and little bluestem have established as the backbone of the meadow. Black swallowwort management is ongoing, and will continue to be an important part of the long-term maintenance plan for this project. Annual mowing will continue in early spring as part of the long-term maintenance of the project area, allowing us to properly monitor the site and respond rapidly to signs of re-infestation. With the careful planning for long-term maintenance built into the management plan before the first vine was removed and the dedication of the property owners and other stakeholders involved in this project, we are confident that this restoration project will continue to be a success. September 2017. 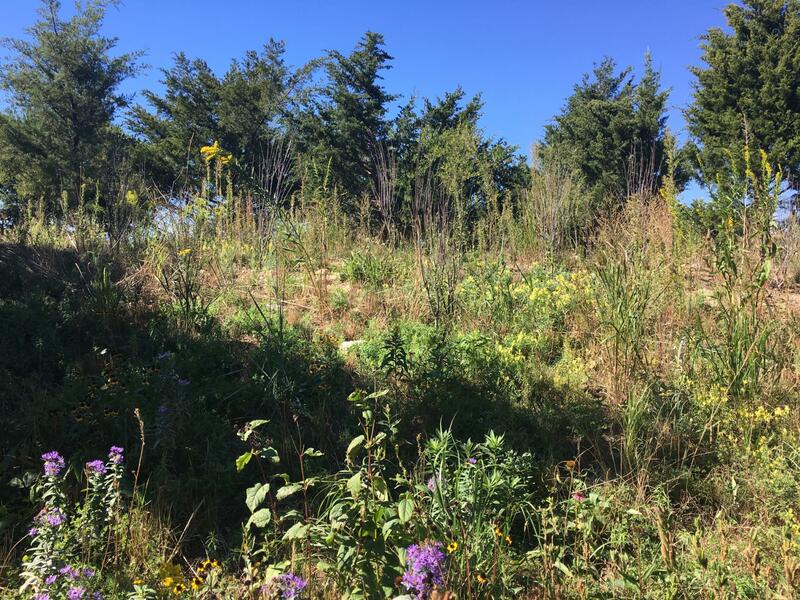 Multiple goldenrod and aster species, along with Indian grass and other native warm season grasses, have replaced the matted layers of invasive vines and shrubs, providing wildlife habitat, color, and structure in the maturing late summer meadow. September 2017. 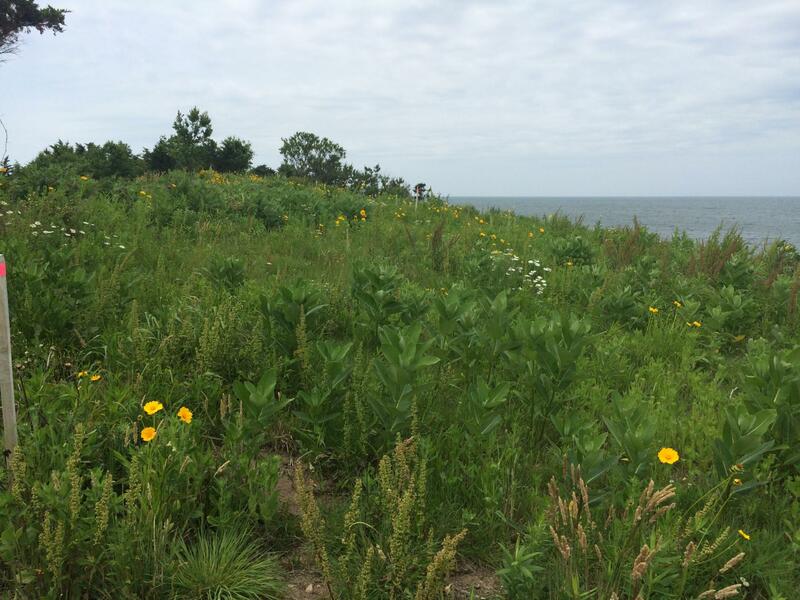 After four years, the thicket of invasive plants overlooking the waters of Buzzard’s Bay has been restored to a thriving native plant community. Thank you to Keith Johnson of Billingsgate Land Management for his expert machine work and to the dedicated crew at BlueFlax Design LLC. Without their hard work and expertise, projects like these wouldn’t be possible. 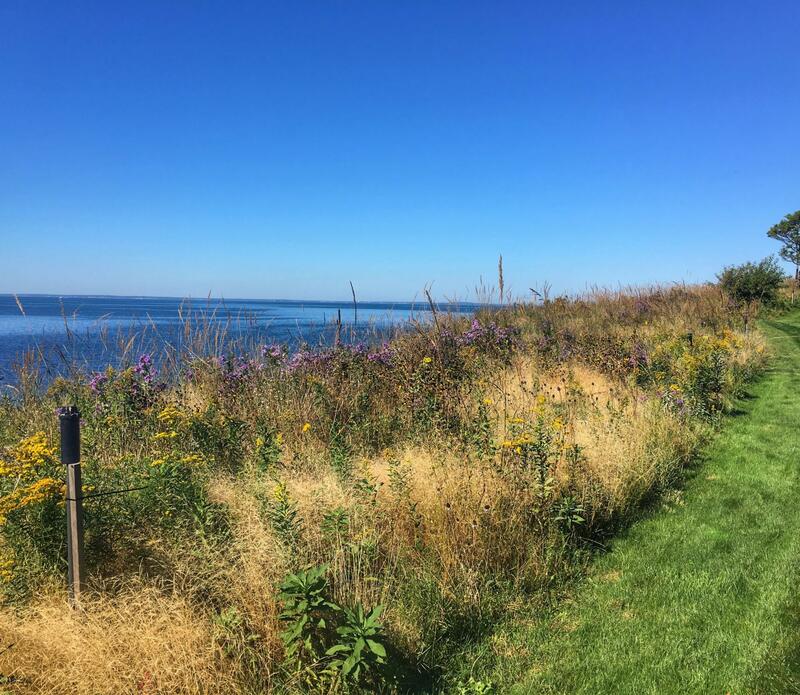 Theresa Sprague is the owner of BlueFlax Design in Harwich, MA, where she focuses on merging science with the fine art of landscape design to create beautiful, ecologically sound, and sustainable landscapes, restoring ecological function and integrity to the built environment. 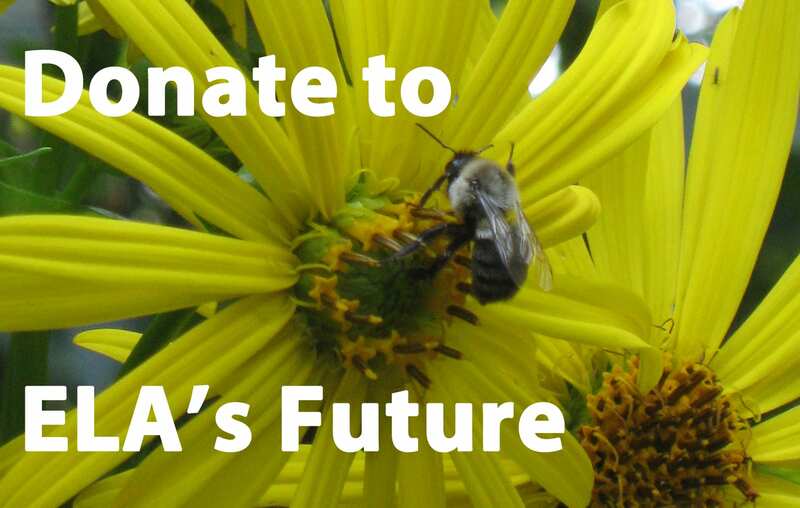 She seeks to create habitats that support the needs of both people and wildlife. 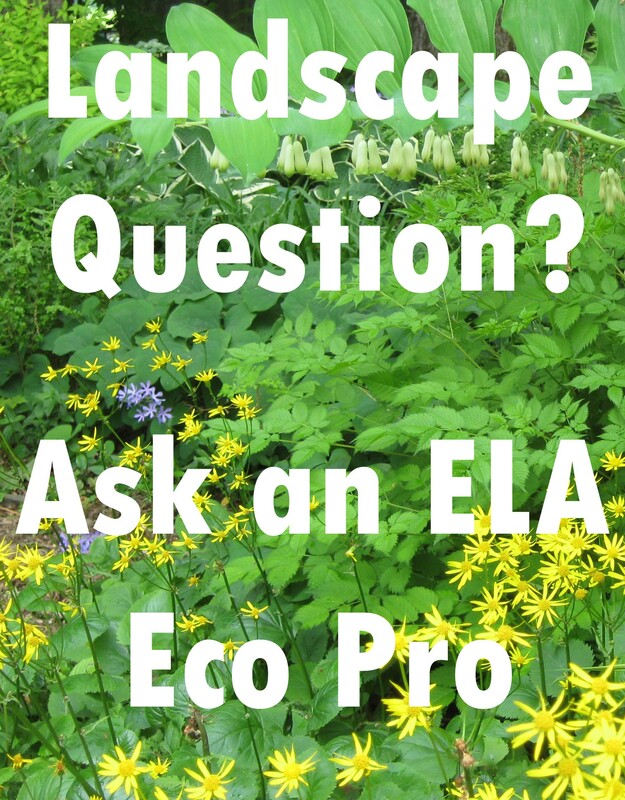 Theresa holds a master’s degree from the Conway School of Landscape Design and has over 15 years of planning, design, ecological restoration, gardening, and land management experience. 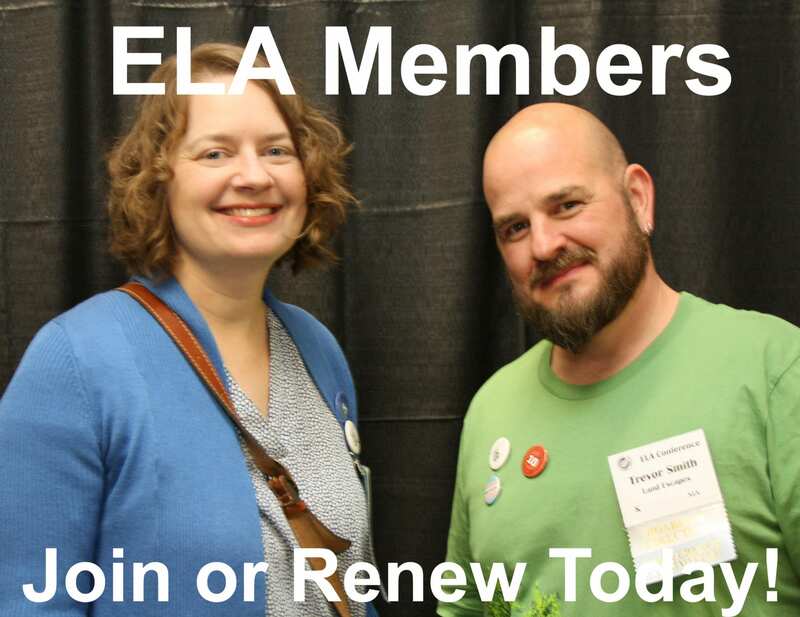 She may be reached at theresa @ blueflaxdesign.com.